Lloyd Sabin feels it is only a matter of time until Banbury get their rewards. 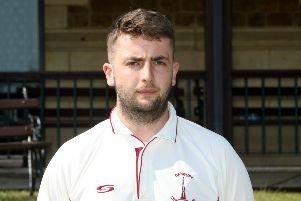 The Banbury captain is happy with the way his side are playing even though they are not getting the victories they need to get back into the Home Counties Premier Cricket League title race. Banbury travel to High Wycombe for Saturday’s division one fixture on the back of another draw, this time against champions Henley. Richard West returns but Graham Beer and Will Briggs are unavailable so Sabin will decide if he brings in a spinner or another batsman. Sabin saluted century-makers Ollie Clarke and Qaasim Adams following their club record-breaking third-wicket stand against Henley. Sabin said: “That partnership was top drawer and probably one of the best I’ve seen at the club. They had to run really hard to start with but once they got in they made sure they took advantage. “Qaasim would be the first to admit that he didn’t get off to the start he wanted but the wickets were really tough for the first few games. It was only going to be a matter of time until he started scoring runs and he’s doing really well with the ball for us as well now. “That was Ollie’s first ton in the league, it’s one that he will be pleased with as it came against one of the best bowling attacks in the division.